I am trying to merge two text columns (consisting of 2 digit and 3 digit numbers respectively) into one in ArcGIS 10.2.1 desktop version, but unable to do so. I have added a new field and kept it as text. On using arc toolbox > data management tools > calculate field, I am trying to merge the two columns into the newly created column. I have the following two columns in the shapefile - Code1 (text, 10) and Code 2 (text, 10). I want to concatenate the values in these two columns in a new data field Key (text,11) that I have already created. Change the Parser in the Field Calculator to "Python". For the field calculation, double click the fields you want to add, separating them by a plus sign. (Plus sign is also used when concatentating strings). Edit: Question was updated to include error message "No records within table". This is possibly due to extent in the environment settings per ArcGIS Calculate Fields gives Warning 000405 No records within table? Check if extent from spatial data has been set and if data being concatenated is extrapolating it. See: ArcGIS Calculate Fields gives Warning 000405 No records within table?. In field calculator, two options to concatenate fields exist: using VB parser or Python parser. Python parser: see smiller's answer. Not the answer you're looking for? Browse other questions tagged arcgis-desktop field-calculator text table-of-contents concatenation or ask your own question. 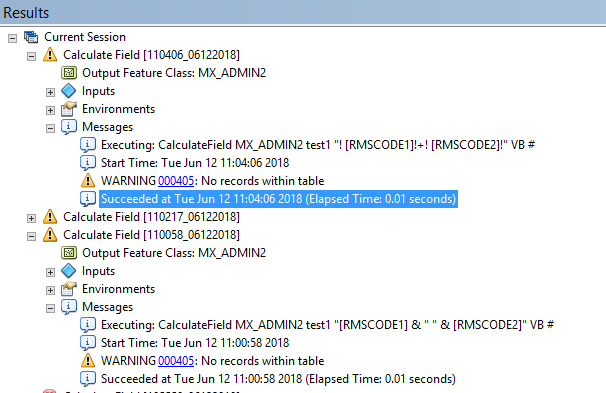 ArcGIS Calculate Fields gives Warning 000405 No records within table? Adding hyphen in ArcGIS Field Calculator to merge two columns? How to assign a new name for values selected from two columns? Concatenating two fields (type double) into single field?